I love sending and receiving real mail. Not just on birthdays, but any occasion I can send someone some sweet snail mail I love the chance to put a smile on someone’s face. Today’s d.i.y. 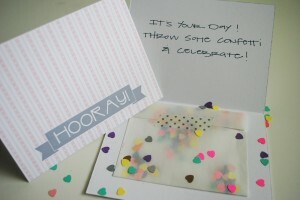 craft tutorial will give you just that chance when you create and send someone this adorable, homemade confetti card. I have seen fancy confetti filled cards at boutiques and online stores before but I wanted to recreate this idea in a tutorial that could easily (and cheaply) be done with items you can find at home. Below you will find step-by-step instructions on how to make this one-of-a-kind creation AND a free printable template of the “hooray” card I designed just for Pretty Southern readers. You can print it right at home, in any of three color schemes, and use it for your confetti card today. I think that deserves a HOORAY! A card for the base of the project, you can use an blank greeting card you have already or print the free template I have included here. 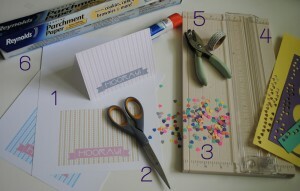 Confetti- you can make your fromscrap paper using a hole punch or simply buy a bag. 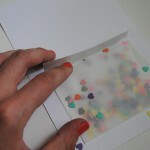 Parchment paper for the “pocket” you will create to hold the confetti. I used this because I already had it at home from baking and it has a nice translucent quality that allows the confetti colors to show through. 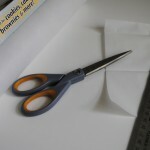 You could also use tissue paper, vellum, or regular paper. Print and cut out your card. I have included printable templates in blue, gold, and grey. These can be printed at home on a heavy 8.5″x11″ paper or cardstock. Then cut your card out to a standard card size- 8″ high by 5.5″ wide and fold at the 4″ mark. 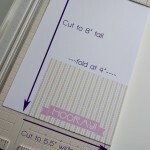 There are cutting guides on the template to make this super easy! Next you will create the pocket that will hold the confetti on theinside of your card. I cut my piece of parchment paper to 3″x7″ and then folded slightly off-center (horizontally) to leave a little space at the top for a flap to fold over and close. The end pocket was 3×3 with a top flap of 1″. Fold and glue the back of your pocket to the inside of your card. Then put a little glue up each edge to hold the front and back of the pocket together. Make sure you leave a little extra at the top for a flap to hold the confetti in. Fill the pocket with confetti. Tape the pocket closed and add a personal note to your recipient. You are finished! Send this little gem off to someone special! I hope you enjoyed this crafting lesson and I will be back here posting more d.i.y. tutorials for you to keep your creativity flowing! 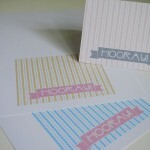 Print your free hooray cards from one of these files:HooraycardgrayTemplate, HooraycardgoldTemplate, HooraycardblueTemplate. **project and templates copyright katjackson 2011 and should only be reproduced for personal use.